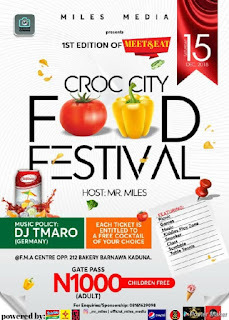 Miles media Team brings an Amazing Food and Networking Festival: scheduled to take place in Kaduna City on the 15th December 2018. The event will feature a series of attractions like barbeque, music and dance performances, snooker, scrabble, table tennis and lots more. Venue: F.M.A Centre, opp 212 Bakery Barnawa Kaduna.